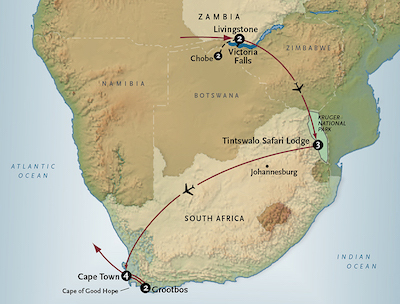 Follow in the footsteps of the Big 5 with this journey to South Africa and Victoria Falls. Guests literally follow animal tracks on foot and in open-air Jeeps through the South African Bush on the border of Kruger National Park. This adventure is followed by a visit to metropolitan Cape Town and the South African winelands as well as to the Western Cape to see the penguin colony at Stony Point. The Big 5 aren’t the only animals that make South Africa unique. Top the entire journey off with the discovery of South Africa’s Marine Big 5 — whales, sharks, dolphins, seals and penguins. Your journey begins in Livingstone, where you’ll be escorted to The River Club, our intimate luxury hotel on the Zambezi River. Relax on a sunset cruise with cocktails as elephants and other wildlife gather around the river to quench their thirst. Enjoy an elegant dinner accompanied by fine South African wine. Danger Point and Knife Edge Bridge are names that may strike you as overly dramatic, but they capture the exhilarating views that will leave you breathless on your expertly guided tour of Victoria Falls. *Note: Water levels are lower from August to November, and vantage points will differ. Fly to Kruger, South Africa and transfer to the luxurious and very intimate Tintswalo Safari Lodge on a private game reserve. Over the next two days, you’ll join our certified, expertly trained safari guides and no more than six other guests in open Land Rovers for exciting morning and afternoon game drives. With few visitors and an amazing concentration of wildlife roaming the open vistas of this unspoiled private reserve, Tintswalo offers some of the most dramatic game-viewing in Southern Africa. Enjoy a second full day of wildlife adventures with our expert safari guides. With an unfenced boundary along Kruger National Park, the abundant wildlife here includes the Big 5, cheetah, impala, rhinos and large herds of buffalo drawn by the quality grazing. Guided bush walks, open decks overlooking an active watering hole and elegant dining complete this ultimate safari experience. Fly to Cape Town where you’ll be escorted to the exclusive Cape Grace Hotel near the lively Victoria and Albert Waterfront. Enjoy dinner and an evening at leisure. Start your day with a ride in the revolving cars of the Table Mountain Cableway, ensuring amazing 360° views as you ascend. Then trace Cape Town’s rich multi-cultural history, from its seafaring early days to the end of Apartheid, as we show you the city’s important sites and landmarks. Expert island guides promise a stirring and inspiring experience as you tour Robben Island. Chapman’s Peak, with its 114 curves, is hailed as one of the world’s most spectacular drives. Along with the amazing scenery, you’ll discover the flora and fauna and charming coastal villages of the Peninsula as we take you all the way to the Cape Point Lighthouse on historic False Bay. Return to Cape Town for lunch. Travel into the heart of the pastoral Winelands to explore Stellenbosch, a historic town filled with stately Cape Dutch, Georgian and Victorian homes. At the nearby Simonsig Estate, founded in 1688 and hailed today for its robust reds, you’ll enjoy a cellar tour, wine tasting and a traditional Sabrage – the opening of a bottle of Cap Classique with a sword! After lunch at Racine, nestled at the foot of the Franschhoek Mountains, you’ll enjoy another vineyard visit and wine tasting before returning to Cape Town. Today, you'll see the penguin colony at Stony Point and learn about the region’s Fynbos eco-system as you continue to the Grootbos Reserve, overlooking Walker Bay in the Western Cape. After lunch, explore the reserve’s 1,000-year-old Milkwood Forest. Later, meet with experts to learn how the Grootbos Green Futures Project trains future leaders. Then enjoy an elegant dinner with fine wines. You already know about the Big 5, but South Africa’s Marine Big 5, which encompasses whales, sharks, dolphins, seals and penguins, are equally spectacular. Led by our expert marine biologist, today’s thrilling expedition (weather permitting) takes you out onto the waters where the Indian and Atlantic Oceans converge, where you will see Cape Fur Seals, breaching dolphins and have the chance to trawl Shark Alley, home to Great Whites. From June to November, Southern Right whales are regularly spotted. This afternoon, choose another included adventure to fit your style: A 4x4 nature safari with spectacular views or an exploration of the caves and beaches of Walker Bay. Tonight’s farm-to-table dinner is enhanced by fine wine. After breakfast, we’ll take you to the airport. This owner-run Zambian lodge provides stunning views over a sweeping bend on the river, and the staff of the River Club encourages guests to relax and enjoy the surroundings. Steeped in history, the Lodge saw the settlement of Livingstone as a settler trading post and its evolution to a destination for royal travellers and Hollywood stars—it even served as a gateway for displaced people after World War II. The lodge is set on a 50-acre secure property with manicured gardens and amenities that include a swimming pool, river cruises, tennis, fishing, and a fitness center with jacuzzi and sauna. The 10 guest rooms are decorated with fittings made from Rhodesian teak wood and include wifi internet access, digital safe, and mini-fridge with bottled water. Our stylish, 5-star eco-paradise offers private Forest Lodges set on a sweeping expanse in the Cape Floral Kingdom. Enjoy exceptional dining every day featuring the finest locally-sourced ingredients. Staying at Cape Grace is an experience in itself, melding the modern comforts of a Cape Town luxury hotel with traditional Cape culture. And there is no better position for a V&A Waterfront hotel than with Table Mountain standing sentry and towering over the hotel, a working harbor to one side and a multi-millionaire yacht basin on the other. It’s a heady mix of tantalizing experiences, which makes time spent at Cape Grace something to remember forever. For Sep 15 to Nov 17, 2018 departures, add $3400. For Jan 26 to Mar 23, 2019 departures, add $3700. For Apr 20 to Jul 10, 2019 departures, add $4000. For Aug 10, 2019 departure, add $4300. For Aug 14, 2019 departure, add $4200. For Aug 31 to Nov 2, 2019 departures, add $4400.